White kitchen cabinets are easily at the top of the request list for kitchen refaces and refinishes at Better Than New Kitchens. There’s nothing like a fresh, clean white kitchen. It is such a versatile color that depending on which hue, door style, and hardware you choose, you can create any style of kitchen from traditional to modern, from French country to mid-century modern. Whether you style your kitchen in all white or if you embellish with pops of color, like with an accent color kitchen island, it is sure to be clean and bright. White kitchen cabinets look great with warm wood, contemporary stained concrete or cool ceramic tile floors. Dark granite or slate counters would pair nicely, but a light quartz or muted soapstone would complement the white kitchen cabinets just as equally. 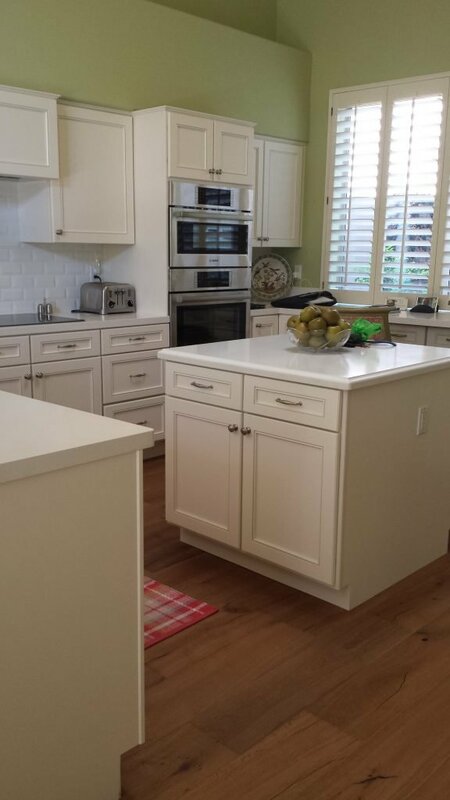 Your possibilities are endless when choosing white for the primary color of your kitchen reface or refinish, and that’s what is so wonderful about white kitchens and why they are so popular. It’s a timeless choice that not only goes with everything, but also brightens the room and provides a sense of openness and freshness. 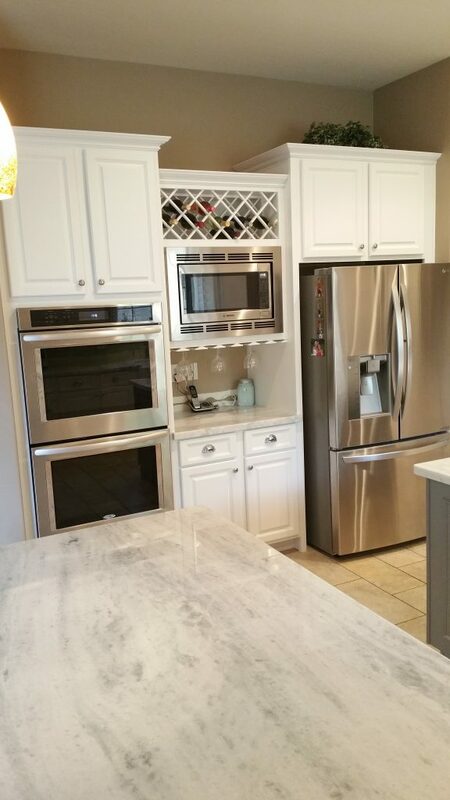 Below are a few examples of white kitchen cabinets that Better Than New has refaced or refinished. For more images visit our Gallery. 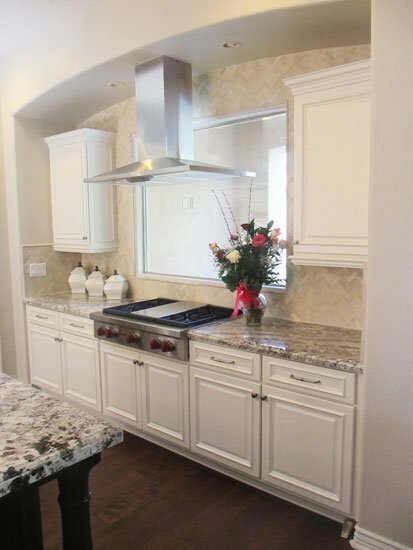 For this Scottsdale, Arizona kitchen reface (above), the clients chose a traditional door profile and used a white shade that was custom made for one of our previous clients. The color is called “A. Smith White” and is one of our most popular shades. In this kitchen Better Than New refaced all the cabinets, applied new doors and drawer faces and rebuilt the microwave cabinet with wine rack and wine glass holders. 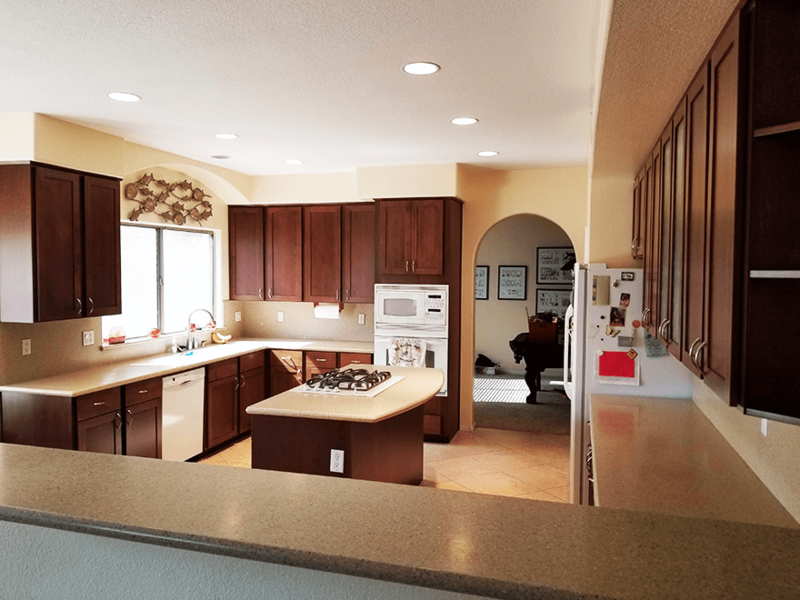 The image below shows a kitchen in Phoenix featuring a partially white reface, in which the wall cabinets were refaced with a cafe brown stain & chocolate brown glaze. The kitchen island was refaced with a custom white lacquer & the same chocolate brown glaze to accent the applied moulding door. 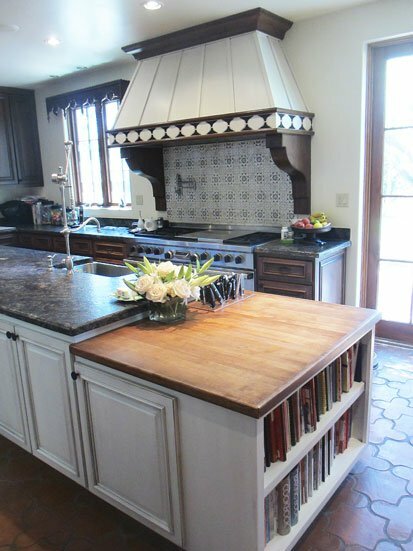 Better Than New Kitchens custom built the range hood which ties this whole kitchen together. Another custom feature provided by BTN is the bookcase at the end of the island. The North Scottsdale kitchen reface featured below uses the same applied moulding door as the image above. The difference is the doors below do not have a glaze atop the custom “A. Smith White” lacquer. Better Than New also custom built the two upper cabinets flanking the Viking stovetop. 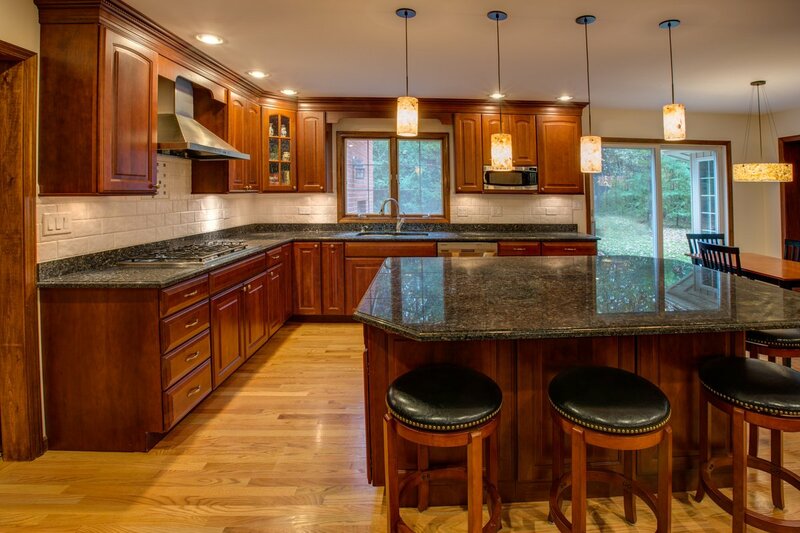 The clients chose a black & white granite countertop which ties in the island refaced with contrasting dark brown lacquer. The image above features a refinished butler’s pantry in distressed antique white located in Paradise Valley. 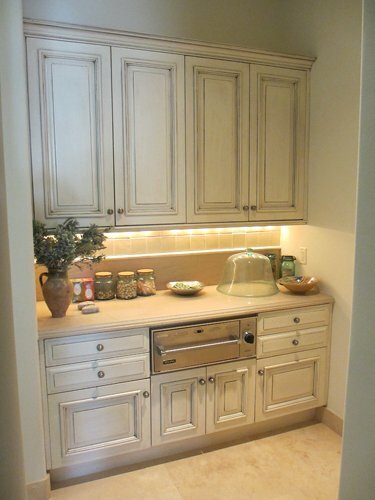 The Phoenix Arcadia kitchen reface featured below highlights a simple, clean design. Notice the drawer and door hardware. This is an example of how subtle details, such as mingling hardware styles, can accentuate a kitchen.